Rue (Ruta graveolens, Linn.) is a hardy perennial herb of roundish, bushy habit, native of southern Europe. It is a member of the same botanical family as the orange, Rutaceae. In olden times it was highly reputed for seasoning and for medicine among the Greeks and the Romans. In Pliny's time it was considered to be effectual for 84 maladies! Today it "hangs only by its eyelids" to our pharmacopoeia. And with darkness, and end with despair." The much branched stems, woody below, rise 18 to 24 inches and bear small oblong or obovate, stalked, bluish-green glaucous leaves, two or three times divided, the terminal one broader and notched at the end. The rather large, greenish-yellow flowers, borne in corymbs or short terminal clusters, appear all summer. In the round, four or five-lobed seed vessels are black kidney-shaped seeds, which retain their vitality two years or even longer. The whole plant has a very acrid, bitter taste and a pungent smell. The plant may be readily propagated by means of seed, by cuttings, by layers, and by division of the tufts. No special directions are needed, except to say that when in the place they are to remain the plants should be at least 18 inches apart - 21 or 24 inches each way would be even better. Rue does well on almost any well-drained soil, but prefers a rather poor clayey loam. It is well, then, to plant it in the most barren part of the garden. As the flowers are rather attractive, rue is often used among shrubbery for ornamental purposes. When so grown it is well to cut the stems close to the grouhd every two or three years. 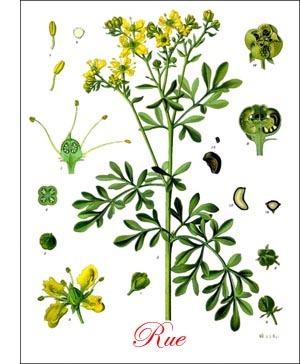 Because of the exceedingly strong smell of the leaves, rue is disagreeable to most Americans, and could not become popular as a seasoning. Yet it is used to a small extent by people who like bitter flavors, not only in culinary preparations, but in beverages. The whole plant is used in distilling a colorless oil which is used in making aromatic vinegars and other toilet preparations. A pound of oil may be secured from 150 to 200 pounds of the plant.